One of the most noticeable things about pickleball is the name. Unlike tennis or soccer (or football, if you’re anywhere in the world outside of the USA), pickleball’s name sticks out from the line up. One of the many questions that people have about the sport (outside of asking if there are actual pickles involved, to which we answer that it depends on what you have for lunch) is how the sport got its interesting name. After all, you don’t see too many other sports that are named for a kind of food, instead of being named for some part of the game play (we’re looking at you, basketball). Pickleball was first played in 1965 on Bainbridge Island in Washington. Joel Pritchard, Bill Bell, and Barney McCallum and their families were all hanging out during the summertime and decided that they wanted to play badminton. As it so happens, when you get more than one family together with kids, things go missing, and the family friends couldn’t find a shuttlecock to play with. The story goes that they settled on a wiffle ball and traded out the more flimsy badminton rackets for some ping-pong paddles they had nearby. A quick tennis net lowering later, pickleball was born. But the name didn’t come along as quickly as the improvised game supplies did. Much like the start of any great sport, there is a fair amount of legend that surrounds that fateful evening in 1965 where the three families gathered together to try and decide on a name for their impromptu game. The most entertaining, and most popular story involves Pickles, the family dog, and his fascination with chasing after the wiffle ball when it was knocked off the court. Residents of Bainbridge Island will swear up and down that this small cocker spaniel single handedly provided a name for one of the fastest growing sports in America, but other people have shot down the naming origin story, saying that Pickles was named after the game, and was not the source of possibly the best title for a sport since the invention of Korfball. In an interview, Joan Pritchard, Joel Pritchard’s wife, said that the game was named after her family’s love of maritime activities. In rowing, when picking teams the final team will be compiled of who ever was not chosen first, creating what is known as the “pickle boat.” Joan said she suggested the name due to the miss-match nature of the game, and how it was created off of only the leftovers from other games they had around them at the time. While this has been cited as the “official” reason for the origin of the name pickleball, players still hold tight to the mythos that has been built up around Pickles the dog, refusing to accept the maritime influence on the name. Regardless of how one of the coolest sports names to ever exist game to be, pickleball is one of the fastest growing sports today, and has become increasingly popular with players ranging from college students to retirees. But what makes pickleball so popular? Pickleball has been growing in popularity for years ever since that first game back in 1965. Part of the draw to the sport is the oddness that gained it the name “pickleball.” Upon first glance, the game looks like something made up by a group of kids in the backyard. Played with pickleball paddles, which are slightly more square than ping pong paddles and can be made of wood or plastic, and a ball that resembles a standard tennis ball, this sport is sure to turn more than a few heads. But that’s what makes the game so appealing. With its varied rule set and interesting quirks, like the inclusion of the “kitchen” area in front of the net, pickleball stands out from the other games being played today. One of the larger draws to pickleball is that it can be played in a relaxed or competitive setting, and due to the calm nature of the gameplay itself, it does not put a huge amount of strain on the body of the player. This lets people participate in the sport that may be unable to play more fast-paced games like soccer and basketball. 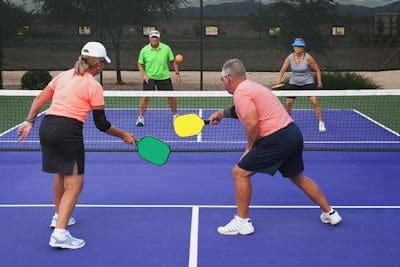 Pickleball is perfect for older players who are looking to have fun while exercising without having to worry about injuring themselves or irritating movement-based conditions like arthritis. Another thing that makes pickleball so easy to play is that it can be done using simple equipment. While there are specially-made pickleball courts, pickleball can be played on any tennis court with a little bit of ingenuity and a slightly lower net. Although pickleball courts are smaller than tennis courts, nothing says that a casual game cannot be played at your local gym, making it an easily accessible game to people everywhere. This has made it particularly popular with college students, as many campus have a gym area and activity courts, and the game can be picked up without having to invest in expensive equipment. A low-end pickleball paddle costs about $13, making it an easy game to get in casually without having to worry about a costly start up investment. Pickleball can be played both casually and competitively, with competitive leagues springing up across the United States due to the ease of starting up a game, the relaxed nature of the gameplay, and the increasing interest in the sport. Tournament games are quite competitive and tend to be much stricter on faults and scoring than more casual games, however the same core rules that keep pickleball from becoming a dangerous game stay in place even in the higher standings of the game. Tournaments still abide by the kitchen volley rule that helps prevent spiking and injuries to other players, and while the games can become more intense, they do tend to have a similar feeling to playing with a group of family friends. This relaxed nature to the whole sport of pickleball is what attracts so many different players to the sport, regardless of their age group or background. How do you choose a pickleball paddle? So you’re ready to break into the world of pickleball. Maybe you were drawn in by the (in my opinion) really cool name, or you’ve done your research on the sport and think it’s right up your alley. Either way, the first thing you should do is invest in a good pickleball paddle so you can serve up your best pickleball moves. 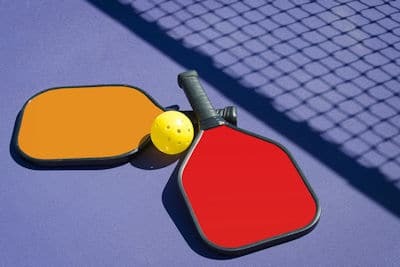 While pickleball paddles are really quite similar in look to professional ping pong paddles, the slightly wider top portion is what causes the major distinction between the two kinds of paddles. Pickleball paddles are made out of wood, wood composite, and graphite, however more dedicated players to the game prefer the graphite paddles for the sound they make when they come in contact with the ball. When you’re looking for the right pickleball paddle, keep in mind the kind of price range you are looking for. While a basic wooden paddle can range closer to between $13 and $36, the higher end pickleball paddles that professionals prefer can be upwards of $150. Making sure you know the kind of paddle you want to invest in can help you narrow down your selection. Wooden paddles are good for beginners and casual players, while people who have played pickleball before and are looking for more durable, high-quality paddles should invest in a paddles made of graphite. Before buying your new paddle, check the grip size of your paddle of choice to make sure it’s the right size for you. Paddles are measured much the same as tennis racket handles, meaning they are available in increments of 1/8ths of an inch. A small paddle can be between 4 inches and 4 ? inches in diameter around the handle, and is idea for people with smaller hands or who have a lesser grip strength, as they won’t have to worry about a bulky pickleball paddle hindering them while they play. Medium pickleball paddles are around 4 ¼ inches, while the largest handles are 4 ½ inches and are ideal for players with larger hands. A good way to figure out your grip size for your pickleball paddle is to try them out in store, or get a feel for a friend’s paddle, to help you gauge if you will be comfortable playing with a paddle of that size. Finally, pickleball paddles come in different weights that range from 6 to 14 ounces. The weight of the pickleball paddle is determined largely by the material they are made from, with graphite paddles on the lighter end of the scale, while wooden paddles tend to weigh more. While the weight of the paddle isn’t necessarily tied to how well they hit the ball, they can be attached to the level of comfort for the pickleball player. For people with past hand or wrist injuries, or who may have grip issues, a lighter paddle may be easier to play with in the long run. Before investing in a pickleball paddle of your own, figuring out the right weight for your play style is important so you can bring your best pickleball game to the court every time you play.